The Ada County Sheriff’s Office offers comprehensive in-custody reentry programs to help offenders successfully transition back into the community. Inmates have access to substance abuse treatment and cognitive-based programming, as well as follow-up aftercare after they are released from jail. The programs offered are foundational – NOT inpatient treatment. Although the inmates are housed here while they attend programming, the dynamics of inpatient treatment are only introduced. Inmates can pursue inpatient/residential treatment after being released from jail. This programming has had a positive effect on not only the inmates, but also our community as a whole. It has reduced the recidivism rate, which has a direct effect on healthcare and law enforcement costs. Many substance abusers do not realize they have a problem until they get arrested. Available programming can give them the chance to make changes in their lives and prevent any future problems with substance abuse and criminal behavior. How does an inmate get involved in a program? An inmate can enter due to court order, as a term of probation, or through self-referral. These programs are paid for by the inmate. If an inmate cannot pay for the program, the court may offer financial help. Must be classified at a level 4 – 9. Must be free of discipline for a minimum of 30 days. Must be housed in a dorm or able to live in a dorm setting. Inmates housed in the Health Services Unit will be considered on a case-by-case basis. Must have adequate time remaining in custody to repeat the entire program. Must have funding prior to beginning the program. Active Behavioral Change is a four-week class that utilizes the Moral Recognition Therapy, an evidence-based program designed to help individuals change behavior. This program is a systematic treatment strategy that seeks to decrease recidivism among adult criminal offenders by increasing moral reasoning. Its cognitive-behavioral approach combines elements from a variety of psychological traditions to progressively address ego, social, moral, and positive behavioral growth. MRT uses structured group exercises and prescribed homework assignments to teach and reinforce lessons. Classes meet Monday through Friday for two hours per day over four weeks for a total of 40 hours. The cost is $200. 227 inmates successfully completed the ABC program in 2016. The Substance Abuse Program connects counselors with criminal offenders and inmates who are addicted to alcohol and/or drugs. Those inmates learn ways to remain clean and sober. We administer the Substance Abuse and Mental Health Services Administrations (SAMHSA) TAP-19 Relapse Prevention curriculum. The program emphasizes relapse prevention therapy — which breaks down the recovery process into specific tasks and skills. It also shows the offender how to recognize when he/she is beginning to relapse and how to change before alcohol/drug use occurs. Classes meet Monday-through-Friday for two hours per day over four weeks for a total of 40 hours. The cost is $200. 261 inmates successfully completed the SAP program in 2016. The Ada County Sheriff’s Office, in partnership with the Idaho Department of Correction, offers GED tutoring and testing in the jail’s learning center. Tutoring services are offered through the GED online academy with testing services offered through the GED Testing Service and PearsonVue. Inmates are first given an entrance assessment to determine their level of knowledge in four subject areas. They are then given a customized study plan and tutoring sessions designed to prepare the inmate to pass the GED exam. Numerous practice exams are given during the tutoring and only after the individual scores high enough on the practice exams will they be referred to the GED exam. Classes meet Monday, Wednesday and Friday for up to 2 hours. There is no cost to study for the GED. Exams cost $20 each. 18 inmates successfully earned their GED in 2016. 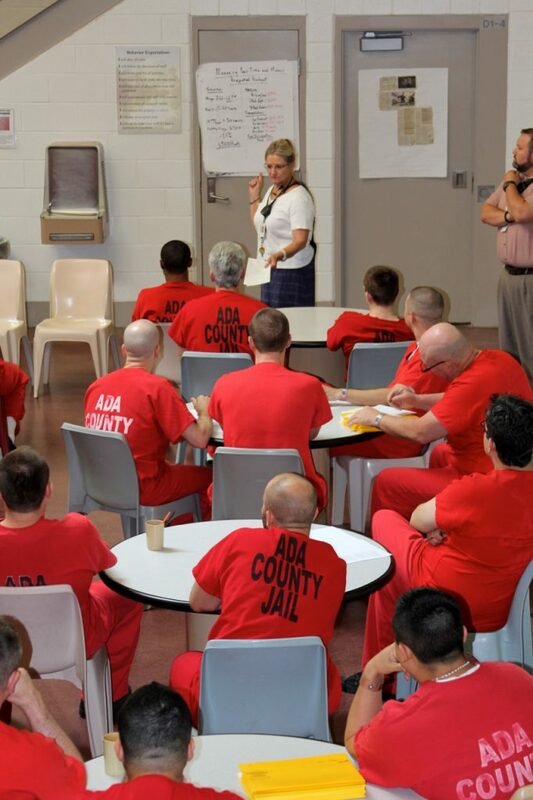 Offenders participating in ABC, SAP, WFR and GED* live in one of our Reentry Dorms. The Reentry Dorms are run using a community model which creates an environment for offenders to practice their newly acquired skills under the supervision of programs staff and specially-trained security deputies. Residents hold each other accountable to a set of behavioral expectations above and beyond jail rules. All classes provided in the dorm are free of charge. *A male inmate worker can take GED and live in the inmate worker dorm. Female inmate workers and programmers already live in the same dorm. We use the National Institute of Corrections’ Workforce Development Specialist and Employment Retention Specialist training to help offenders build the skills they need to obtain and retain meaningful employment after jail. Offenders take the Idaho Department of Labor Skills Assessment to highlight potential areas of employment. Offenders learn skills such as how to complete an application, develop a resume, learn about workplace ethics and culture, and speak to potential employers about their involvement in the criminal justice system. Classes meet Monday, Tuesday, Wednesday, and Friday for 1.5 hours per day over four weeks for a total of 24 hours. There is no cost for this program. 111 inmates successfully completed the WFR program in 2016. Our Work Search program helps offenders secure employment before completing their jail time. An Offender Workforce Development Specialist helps individuals search for jobs using online resources and services from the Idaho Department of Labor and coaches them on interview techniques. Offenders attend interviews in person (wearing a GPS monitoring device) and are transferred to the Work Release program when they obtain employment. The cost is $8 a day for the GPS device.